Hello everyone, and welcome to Hanauma Bay in Hawaii. Hanauma Bay is one of the most popular tourist destinations on the Island. took a day trip to visit the Nature Preserve and Marine Life Conservation District. Hana means bay in the Hawaiian language. walking, or otherwise having contact with coral heads which appear much like large rocks on the ocean floor. About 400 species of fish are known to inhabit the bay. 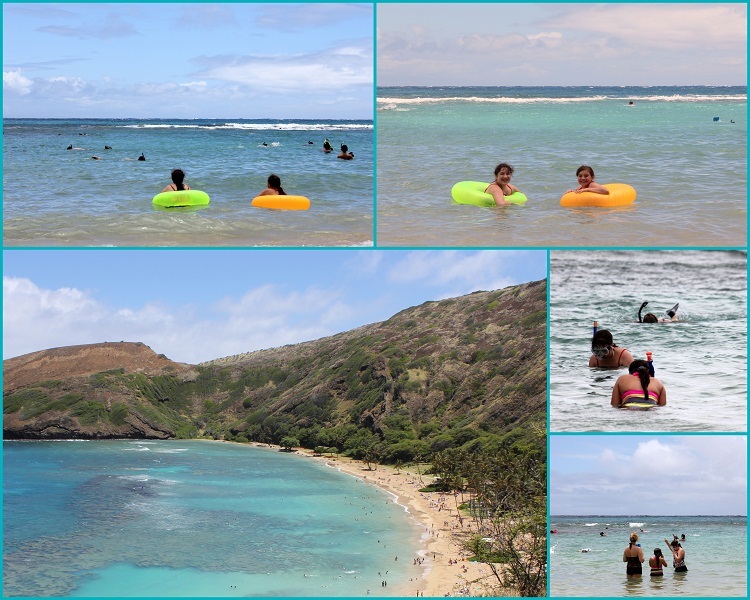 Hanauma Bay is known for its abundance of Green sea Turtles and is a nursery ground for the immature turtles. Can you name Hawaii's state fish? Remember High School Musical 2 song!!! and receive instruction about the conservaton of the Bay's resources. The view is worth the walk. And the water is so clear you can see the coral formations on the ocean floor. The snorkeling is amazing for the young and old at heart. A wonderful grass area, white sandy beach, clean changing rooms and restroom facilities. Snorkeling and enjoying the colorful fish they see. Lots of heads "bobbing up and down"
I'm so happy you joined me on my adventure to a beautiful beach in Hawaii. I will be joining some parties and I hope you visit them too. Looks like fun time...beatiful place.Thanks for sharing.Have a great day! Calling by as another Outdoor Wednesday participant today, thanks for the tour. This is beautiful. I'm in awe of your tour of the island. Definitely a place I'd like to visit someday. Thanks for sharing!! My husband and kids went snorkelling there when we visited Hawaii a few years ago. They had a great time while I took lots of photos! This was a lovely reminder of our holiday in Hawaii-thank you! What a beautiful place, oh, how I wish to be there.